Funny enough, egg noodles are what inspired this beef stroganoff recipe today. I have not had a single egg noodle since we cut out processed food (almost 6 years ago!) – until now. And that’s because I have not been able to find whole-wheat egg noodles at the stores where I shop and, believe me, I’ve looked. There’s just something about those wide fluffy egg noodles that I’ve missed, so you can imagine my excitement when we were out of town and stopped in a Kroger (which we don’t have in Charlotte). I know my daughters probably thought their mom had gone a little cuckoo when I suddenly yelled, “Whole-wheat egg noodles!” and literally scooped up 6 bags in my arms. What can I say, it caught me off guard LOL. So anyway, (oddly enough) I had no plan for these egg noodles, but my husband said he always remembered his mom serving Beef Stroganoff over them – and I was immediately sold. There are of course a meeellion Beef Stroganoff recipes out there, but some call for highly-processed cans of cream of mushroom soup (how he thinks his mom used to make it) while others call for many different steps asking you to add and remove things from the pan. One recipe I saw even asks you to cook with the onion and them remove (discard) a perfectly good onion before serving! 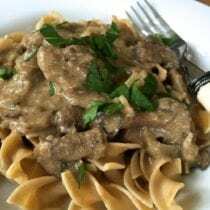 So today I’m excited to present to you a very easy and sensible (and unprocessed) version of Beef Stroganoff …served over whole-wheat egg noodles of course! In your largest skillet (with a tight-fitting lid) melt the butter over medium heat. Add the onion, garlic and mushrooms to the pan and cook for 2 to 3 minutes while stirring occasionally. Meanwhile cut the steak into 1 1/2 inch chunks, season with salt and pepper, and coat them in the 1/4 cup flour. Add the steak and any remaining flour to the pan. Feel free to add a little extra butter to the pan if it gets too dry. Evenly brown the meat on medium-high for 1 to 2 minutes then pour the stock into the pan. Bring to a boil, while scrapping the brown bits off the bottom of the pan, then lower heat to a simmer, cover the pan, and cook for 5 to 10 minutes or until the meat is cooked all the way through and the sauce begins to thicken. Remove the lid and add in 1/4 teaspoon salt, sour cream, mustard, and pepper (to taste). Simmer for another minute or two then serve warm over cooked whole-wheat egg noodles and garnish with fresh parsley if desired. Previous Post: « Whole-Wheat Madeleines! This sounds perfectly delicious! We have given up meat for Lent, but I’m fixing this as soon as Lent is over. My mom and Grams made home made whole wheat egg noodles and they are devine.I can not tell you how delicious homemade noodles are.. Thank you thank you thank you!!! 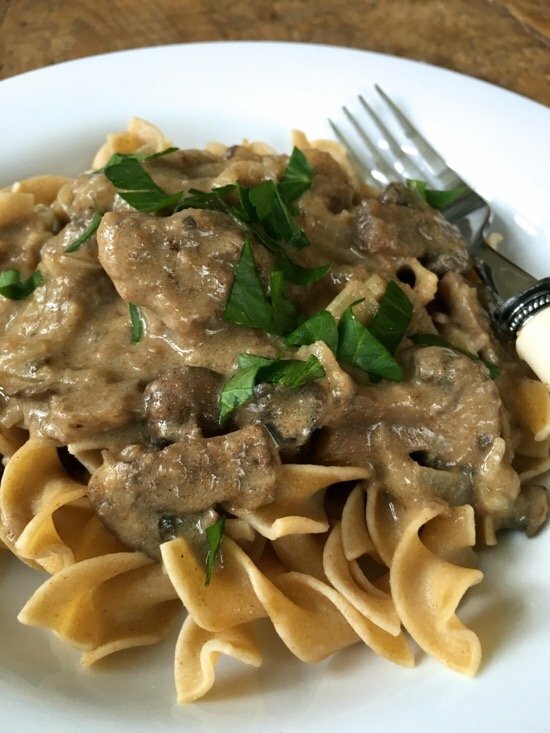 Since we started cutting out processed foods about 18 months ago I have been looking for a good clean recipe for beef stroganoff and have yet to find one – like you said, all the recipes I found seemed complicated. I’ve always been a big lover of beef stroganoff but I always made it with the processed cream of mushroom soup before. I have a recipe that is made in the crockpot, but it too is made with canned soup. Can this be made in the crockpot? Also, I was wondering if you could substitute plain Greek yogurt for the sour cream? I cannot find whole wheat egg noodles anymore either. I will check at my local Kroger. Thanks. Hi. We’ve not tried but I imagine so. A reader commented a little below on her crock pot recipe. We often substitute sour cream for for Greek yogurt. Made this for dinner tonight, another winner with my family. Easy and quick, thanks for the recipe!! heyya.. Nice recipe. Is there any difference between salted butter and unsalted butter while doing this recipe. I mean does they flavors different after preparing it??? Hi. I can almost never tell if I’ve used salted or unsalted butter. I have found whole wheat ones in Giant in the past but haven’t looked recently. I use the Better Homes and Garden’s recipe too, substituting beef stock for the bouillon. Luckily, my local grocery store sells “Ronzoni” whole wheat egg noodles, so I never had to give up stroganoff. Though as farmer’s market meat is expensive, I double the mushrooms so we will have leftovers the next night. I just started making my own chicken stock and hope to start making beef stock as well. I just love beef stroganoff, such a delicious dish! I make mine with a dash of nutmeg and a combination of fresh and dry tarragon. Have you tried making this dish with these herbs? Love to eat this with a steaming cup of rice! Nope, thanks for the suggestion. I followed the directions perfectly but my sauce didn’t thicken much. It doesn’t look appealing. Mine took more flour to thicken too! Next go ’round I will make the rue first before adding it in to the meat. I think this will help. This is a win!! Easy to make and tastes fantastic! Thank you! I am a little confused – if you won’t eat store-bought “processed” egg noodles, why will you eat store-bought obviously “processed” whole wheat egg noodles? Throw it in the crockpot with a little water which you can use for the base gravy. Cut it up first and the meat will be so tender. I cook in the crockpot all the time when we’re camping. If not crockpot, its BBQ. No need to have alot of dishes and pots and pans. We eat healthy and simple. Hello. Lisa does buy a few minimally processed items such as whole wheat pasta. I can’t find beef stock without sugar added… Do you have a store bought option you use? I don’t really want to make it from scratch. Or could I use chicken stock? We’ve not tried this with a different stock. Hi. Not perfect but it is what I often buy: http://www.pacificfoods.com/food/broths-stocks/broths/natural-beef-broth.aspx and does not have sugar. Just made this this week, my husband said it’s the best he’s ever had…I couldn’t agree more! So easy and to think it’s a healthy version of comfort food makes it even better!!! LOVE this site! I normally buy free range chicken stock from Whole Foods and/or Trader Joe’s, but I can’t find any pasture raised beef stock. Any suggestions for where to look? Hi there. You can find it online if you can’t find it in the stores. I know Thrive market has it. We always use yogurt or Greek yogurt to our stroganoff. Gives a slight flavor variation that we really love. Beef stroganoff is always made with tender cuts of beef such as sliced tenderloin or filet, or cuts used for stir fry. Never try to use stewing beef which needs a long time to break down, hence be stewed. Just curious–did you make your own butter, beef broth and sour cream? Noticed you have not had processed food in six years. Thanks! Hi there. No, Lisa still purchases those organic items. She does not make her own dairy products. She makes broth and stock, of course, but not always. I’m allergic to mushrooms. Can you suggest any alternative please? Hi there. You can leave them out. Mushrooms are difficult to sub for but this might help: https://www.thekitchn.com/what-is-a-good-substitute-for-mushrooms-179325.